Created by Chris Peacock and funded by Guys and St Thomas’ Charity, this ingenious design has revolutionised steady drinking for so many people. The handSteady’s Rotatable Handle ™ uses gravity to keep the cup upright, allowing the user to hold the handle at the most comfortable angle for them, unlike rigid handles on standard cups. 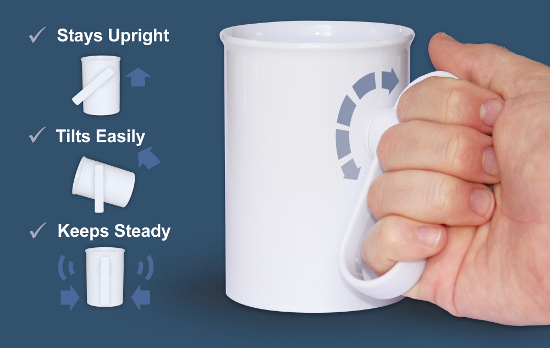 Even if the user’s wrist accidentally moves forward, the Rotatable Handle ™ will correct the angle of the cup, preventing spillages and accidents with hot drinks. Another benefit of this clever device is that it makes drinking from a reclined position much easier, reducing the distance that the user has to rise to take a drink.